Nine buildings have been shortlisted for RIBA North East (Royal Institute of British Architects) 2017 Awards; the winners will be announced at an awards evening at The Biscuit Factory, Newcastle upon Tyne, on Friday 19 May 2017.
. Walwick Hall Hotel, Humshaugh by Doonan Architects Ltd. Regional Award winners will be considered for a highly-coveted RIBA National Award in recognition of their architectural excellence, the results of which will be announced in July. The shortlist for the RIBA Stirling Prize for the best building of the year will be drawn from the RIBA National Award-winning buildings later in the year. The project consists of the conservation restoration of the only grade 1 listed building in Middlesbrough. Acklam Hall in Middlesbrough built in 1689 has remarkable interiors. Acklam Hall Ltd was the successful developer and appointed Howarth Litchfield as architects with a brief to create a mixed use proposal for the site including residential, medical and leisure uses. It was essential to work alongside the developer to create a vision and masterplan which was economically and commercially viable, yet would satisfy Historic England, conservation bodies and the aspirations of the local authority’s planning team The long term prospects are secure with the sensitive repairs to the building that celebrated the layout and its detail. The building now has a financially secure use which allows diners, visitors and users to enjoy. Live Works is part of Live Theatre’s evolving cultural quarter in Newcastle which completes a century old gap in the Quayside, transforming the site into a public place for the community. The project comprises a new centre for children and young people’s writing in a converted Grade 2 listed Almshouse; a vibrant, public ‘pocket park’ which reopens and revitalises the only remaining Georgian courtyard in the city; and new offices where the rental income will fund at least one more play and education project each year for Live Theatre. Our approach was to design a building that would fit seamlessly into its historic surroundings on both the Quayside, where the site is framed by two Grade 2 listed buildings and in its relationship to the warehouses and historic listed Georgian almshouses behind. Durham University commissioned the architect to create a new university building to accommodate their expanding student body and staff, as well as to house a new research facility for the study of fundamental physics. The Ogden Center for Fundamental Physics provides eighty new offices for professors, lecturers, doctoral students, postdoctoral researchers, support staff and visiting academics of the Institute for Computational Cosmology (ICC), the Centre for Extragalactic Astronomy (CEA) and the Centre for Advance Instrumentation (CfAI). Set in a historically complex location, careful consideration was made to the surrounding buildings. A new identity has been created for the Centre resulting in a unique individualized workspace that engenders a sense of connection and community. This refurbishment of the Old Post Office has breathed new life into an iconic Grade II listed building. Preserving its use into the future, the building is now fit for NBS, a digitally focussed organisation. The 3,350m2 headquarters provides a flexible workspace for 200 people and includes a cafe hub, lecture theatre, exhibition space and gym. The result is an environment which inspires users with a diverse mix of agile work settings, promoting a feeling of wellbeing for staff whilst maximising opportunities for collaboration. Although NBS had occupied the Old Post Office for a number of years, the building was subdivided into small tenancies leaving the business fragmented. A key objective was to improve connectivity, creating an environment to support teams working together across functional boundaries. A new lease of life has been given to the headquarters which now meets the needs of this 21st century expanding digital business. Shawm House (old Northumbrian to ‘warm oneself’) is an exemplar in residential design, innovation and construction. The project takes a complex site, challenging brief and budget constraints to produce an elegant, crisp and stimulating building. The design is contextually driven with the barn like form, locally sourced materials and framed views. One is aware of the countryside all around whilst successfully addressing overlooking issues of the clients existing farmhouse. The layout takes precedent from the historic Bastles of the area with the living space on the first floor, though this time it is for spatial quality and views rather than defence. The house is wrapped in a thick larch ‘blanket’ that seamlessly envelopes the roof and walls, below which is a highly insulated and airtight building. The use of integrated renewable technology and rainwater harvesting, coupled with accessible design and low maintenance inside and out all contribute to the holistic and sustainable scheme for the ageing owners. Rigorous design and refinement have helped created a delightful home that celebrates its context and the people who have built it and live in it. The clients had fallen in love with the beautiful site on the outskirts of the market town of Morpeth, and so did we; steeply sloping and edged by woodland, it is a wonderful, challenging context with a brief to create a family home sympathetic to the setting whilst embodying the excitement of a magical woodland hideaway. The building adapts to the sites contours, with arrival separated from private south facing kitchen-terrace, and the garden to the north exploiting the only flat section of the site. 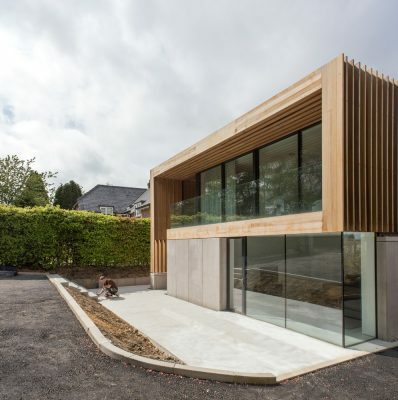 There is an intentionally rich palette of materials; like a Bewick woodcut or the woodland texture around it, the building is made of different grains and surfaces; natural but under precise control with slate shingle cladding to the lower sections and timber above. The cruciform arrangement divides the site into areas of varying privacy and the material treatments give the appearance of a series of single-storey volumes, reducing the impact on the site whilst creating a playful relationship; slate and brick belong to the earth while the timber elements are of the woods and sky, like a treehouse floating above. The Malings is a ground-breaking housing development located on the banks of the Ouseburn, a small river valley that runs into the River Tyne about a half mile downstream from Newcastle-upon-Tyne’s city centre. The former industrial site, once home to Malings Pottery, now houses 76 new homes comprised primarily of terraced houses and ‘Tyneside’ flats arranged up and down the contours of the steeply sloping site, emphasizing the syncopated roofline and allowing all homes to be perfectly positioned for optimum mid-afternoon sun. Taking its cue from the traditional life of terraced streets, every home has its own front door opening directly onto a proper street, the layout of which creates a triangular-shaped communal gathering space at its centre. The Word, National Centre for the Written Word, represents a real paradigm shift in the public library building typology. We were challenged to explore what a library for the 21st century should look like, and what it should offer, at a time when information is available at our fingertips. Our exploration determined that the physical environment was not solely to be a repository for books. We wanted to give each visitor the ability to express their own creativity, providing a gateway to cultural, social and entrepreneurial exploration. Most of all we wanted to capture the imagination of demographics not usually associated with this building type. Our solution provides a rich array of volumes ranging from the grand central forum to individually concentrated reader spaces. The Word’s circular form elegantly presents these spaces as a sequence of experiences which uplift the senses. It is not a temple for silence, but a place for sharing knowledge, from young to old and old to young. The Word is a place for people; the human-centric design placing the individual at the heart of the opportunity to interact, learn and delight. The project brief was the conversion of Grade II Listed Building, Walwick Hall, from a private dwelling to a boutique country hotel with new build swimming pool. The site is located on Hadrians Wall, within a World Heritage Site, surrounded by a scheduled monument. The works included complete refurbishment, alterations and repair of the hall, landscaping works, conversion of outbuilding in to a spa, construction of new build swimming pool and gym, and new biomass heating system. After a number of years being unused and subsequently falling in to a poor condition, the hall has been given a new viable and sustainable use, securing its future. The project has opened the heritage asset to the public, for both hotel guests and the general public who can use the facilities. Tickets for the RIBA North East Annual Awards evening are priced at £28 inc. VAT. Ticket includes welcome drink, buffet and Awards event. More information and to book: http://ribanortheastawards17.eventbrite.co.uk. Five North East buildings won RIBA North East Awards from the Royal Institute of British Architects at an awards ceremony held at As You Like It, (22 April 2016), in recognition of their architectural excellence. The event was hosted by Ian Wylie publisher and editor of The Northern Correspondent.